Multi charge adapter for 18 different connector types and one blank for an additional one if you need it. 4mm Banana plugs into your charger and gives you the ability to charge batteries with the following connectors. 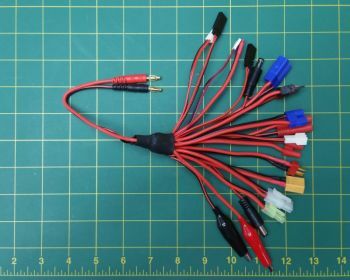 XT60, EC3, EC5, Traxxas compatible connector, T-Plug (compatible with Deans Ultra connector), Tamiya small and large sizes, alligator clips, a bare wire to add your own connector if needed, receiver adapters and many more(see picture).